Hello beauties! Silky and smooth hair is the dream of every woman. For many women, frizzy hair is a daily battle while other women, it can be an occasional problem. Frizzy hair looks dull and very difficult to style. There are many causes of frizzy hair like, humidity, excessive use of blow dryer, swimming in chlorinated water, chemical hair care products, using wrong hair products and the main cause is lack of moisture. 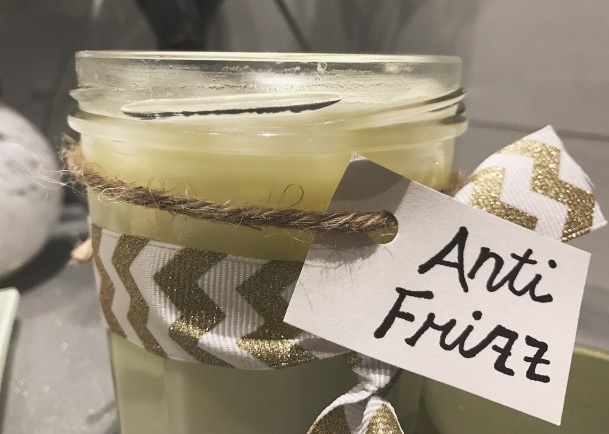 If you are suffering from frizzy hair then try this diy anti-frizz moisturizing hair cream, it will help to control the frizz and moisturize your hair. 1. Mix one cup of coconut milk with 2 tablespoons of olive oil in a bowl using with spoon. Now take another bowl and mix 3 tablespoons of corn starch and 4 tablespoons of lemon juice. 2. Put both mixtures in a glass jar and mix it again. 3. Put the glass jar in microwave and heat it for 30 seconds. Mix it and again heat it until the consistency like a creamy (as shown in the picture). 4. Let it cool down and go! 1. Using your fingers, apply the cream on your hair (it must be dry) and wear the shower cap or a plastic wrap to cover your hair. 2. Leave it for at least 2 hours. 3. After two hours, rinse your hair with shampoo and conditioner. When I have not shower cap, I cover my hair with plastic wrap in the form of tail. I recommend you do it weekly and soon you will feel the difference.